Not even the rain managed to stop the most watched and most exciting fireworks display in the metro now. And last Saturday, hundreds of spectators under their umbrellas looked up in the sky of Manila Bay to witness the spectacular presentation of Japan and Canada to the 2nd Philippine International Pyromusical Competition. This is my second time to cover this year's show, and just like everybody else at SM Mall of Asia, I was very excited to see how this two competing countries will outsmart one another while beating the tremendous amount of rain pouring in Metro Manila. Just a recap, Japan won the 2nd place last year. So, if there's some revengeful thing happened at the sky last Saturday, Japan was behind it. Hehehe. I enjoyed how they excite everyone with their opening scene. The use of music was really cool. One of my favourite actually was the Super Mario theme song where they popped up some cool images in the sky, like the smileys, heart-shaped fireworks and twirls. But I guess what made the crowd applaud that night was the gigantic balloon of colorful fireworks that were really rocking the whole SM Mall of Asia. days before this Saturday's competition where I met the ambassador of Canada to the Philippines. The guy bragged about the upcoming presentation of his country to this competition, but unfortunately, which most of the people who watched the show would definitely agree to me, their show was so boring. They used good music, yeah, but the whole presentation was so dull. We're kind waiting for that big boom, but all we saw were some flares and fireworks showers, which I really find camera-boring. *sadness* Probably, if there's one part that we all loved, that would be the "What a Wonderful World" part. The synchronization of music and fdireworks on that part was really awesome. 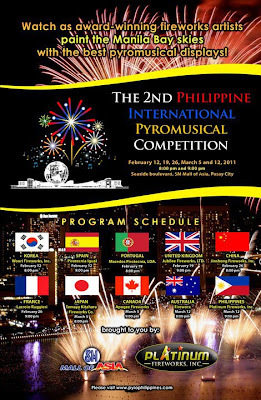 Next week will be the last show of this colorful competition, Philippines and Autralia will be showcasing their talents. And I'm really expecting a good fight and show, so I hope to see you all there! ganda naman ng mga shots mo. Nyak! Ryan, ito na ung mga napili. Ito lang. Hahaha!